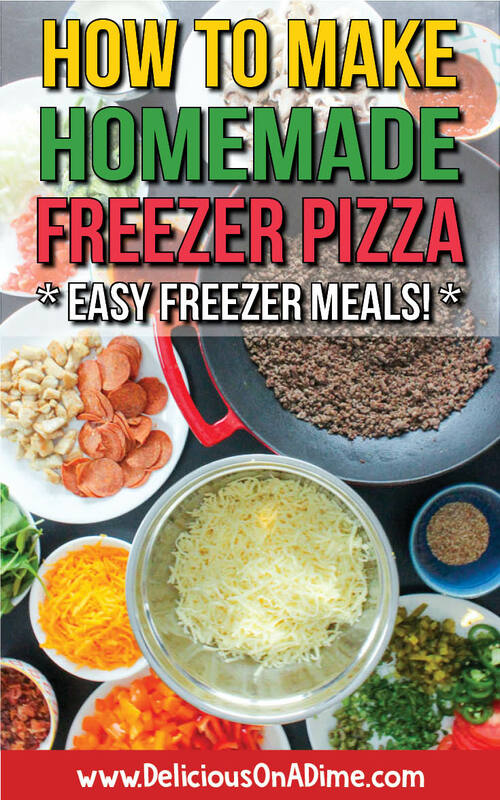 Home » Recipes » Pizza » How to Make Homemade Freezer Pizzas – Easy Freezer Meals! 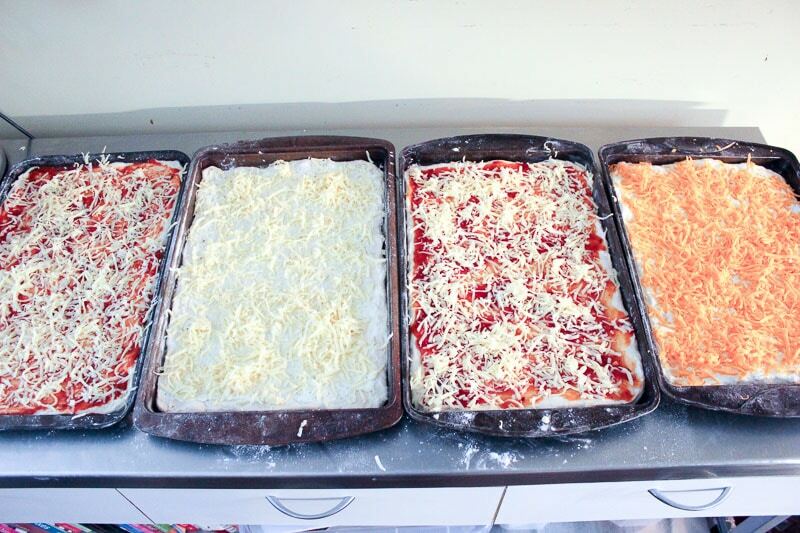 Homemade freezer pizzas are easy, healthy and budget-friendly. Switch things up to suit your family’s tastes or what your kids will eat, or even which ingredients you have on hand! They make the perfect SUPER fast weeknight dinners, easy lunches or fun snacks. If you’ve ever wanted to make healthy freezer meals or easy meals to freeze and reheat, this post is for you! Every winter I start work at my seasonal day job as a tax preparer, which takes me away from home for about 60 hours a week. 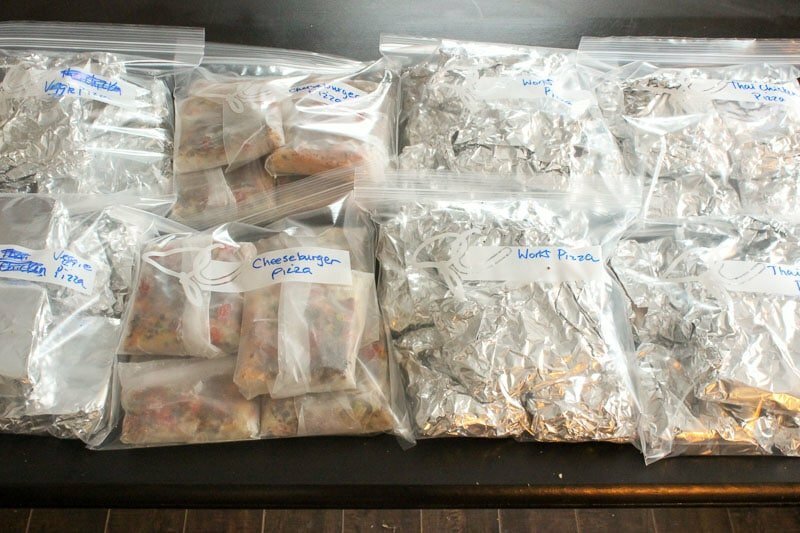 It’s a short but intense period of work, and we always try to make lots of easy freezer meals to have on hand before I start. What we make varies from year to year, based on what we feel like eating and how much prep time we have, but one thing is constant: pizza. Homemade pizza is usually cheap to make, freezes perfectly, and thaws and reheats super well. 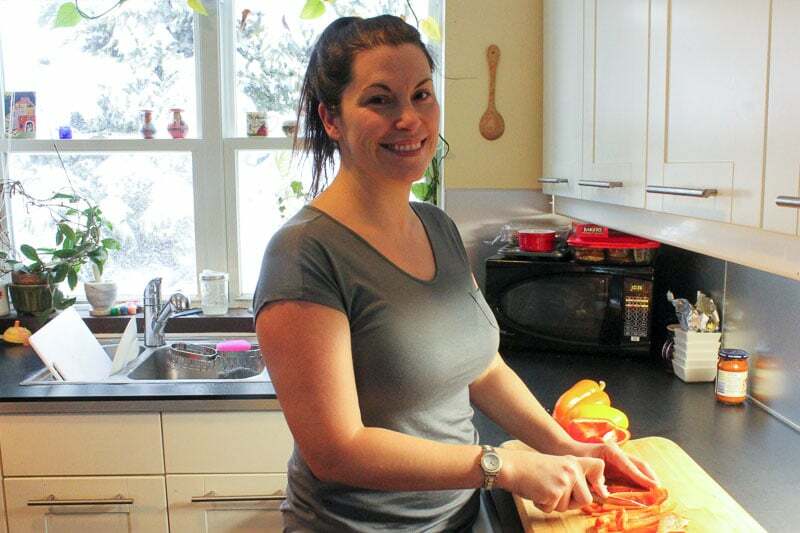 You can make healthy pizza, or less healthy pizza, or a combination – whatever you want! 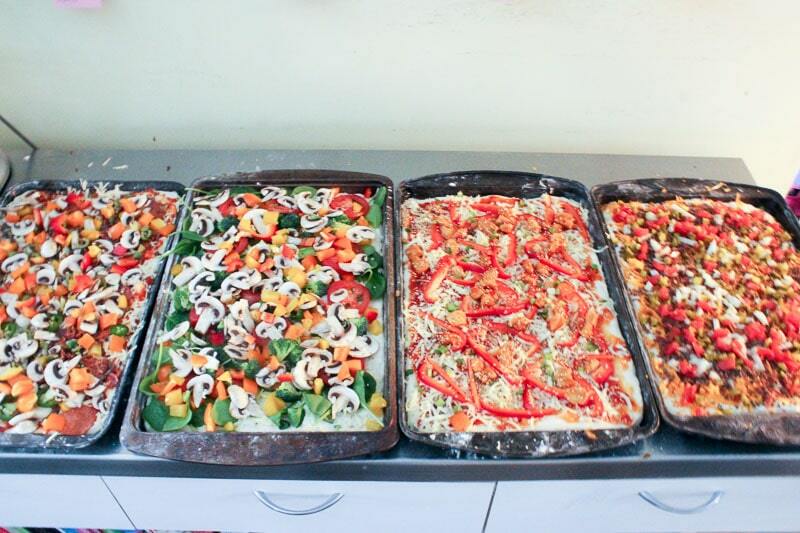 Personally, we cut our pizza up and freeze it in individual portions, for the flexibility it gives us. 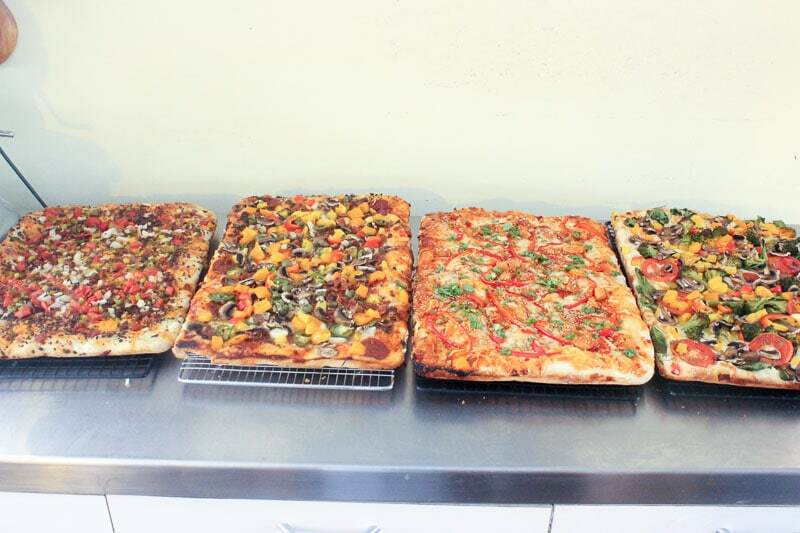 If one of us wants pizza for lunch, we can take out a piece or two. 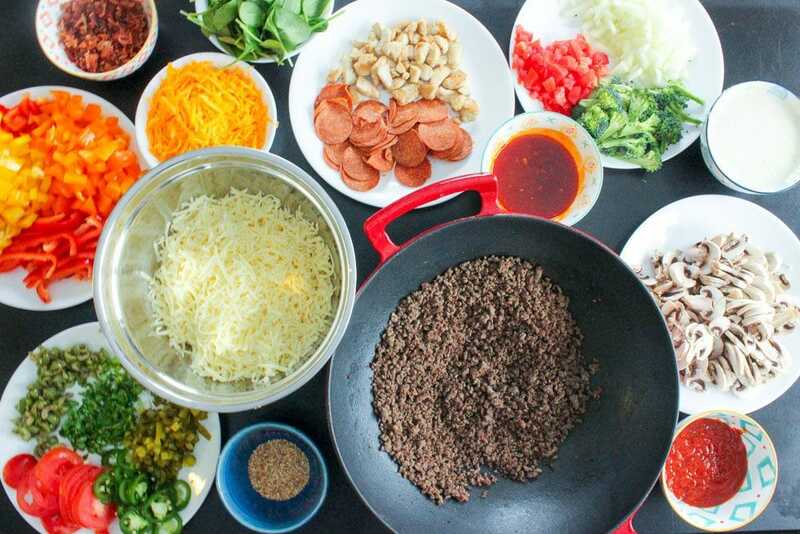 If we want pizza for dinner, we can mix up and take out a few different kinds. The only problem with pizza is that, no matter how much we make, we always run out! This year Laurier and I made four large sheet pan pizzas: a vegetarian pizza, a works pizza, a Thai Barbecue Chicken pizza, and a Bacon Cheeseburger pizza. 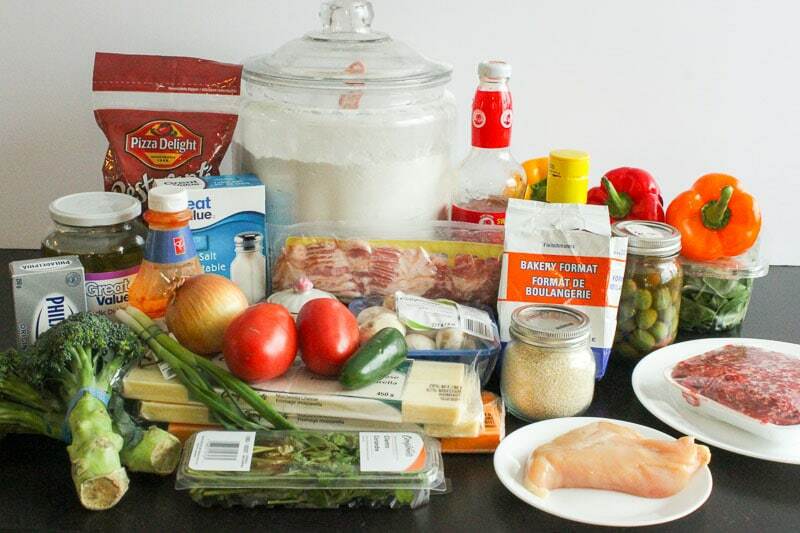 What you need to know is that it’s super easy to have a freezer pizza cooking day, and we’ll show you how to plan it! First, you’ll have to decide what kinds of pizza you want to make. Then, get out all your pizza ingredients so you can see what you’re working with. Start by cooking the meat, since that process takes time. 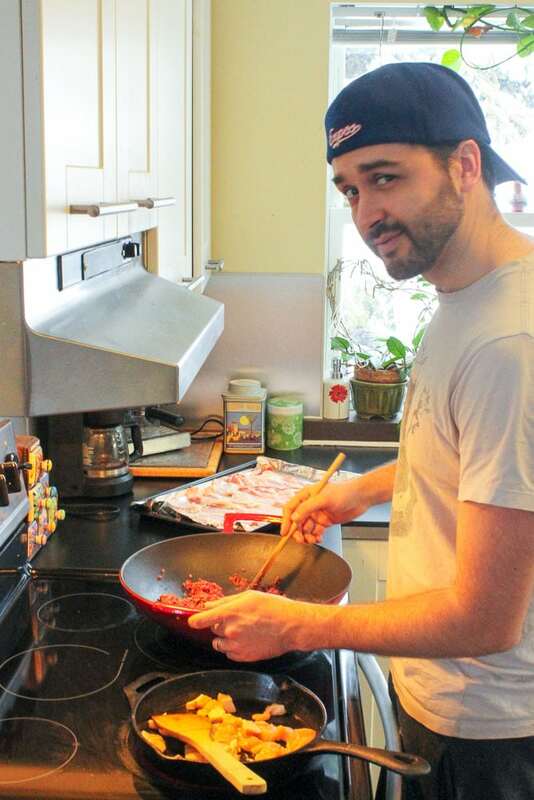 Here, Laurier is browning ground beef and sauteing chicken pieces. 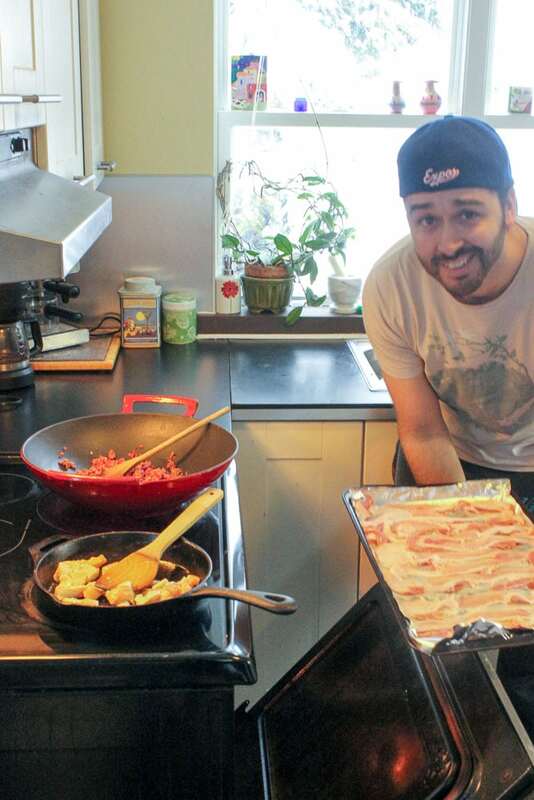 And popping a sheet pan of bacon into the oven (an easy, hands-off way to cook bacon). Starting the chopping! Get one (or a few people) to chop veggies while the meats are cooking. You’ll also want to mix/make any sauces and shred cheese. Once all your toppings are ready to go, mix up your dough. 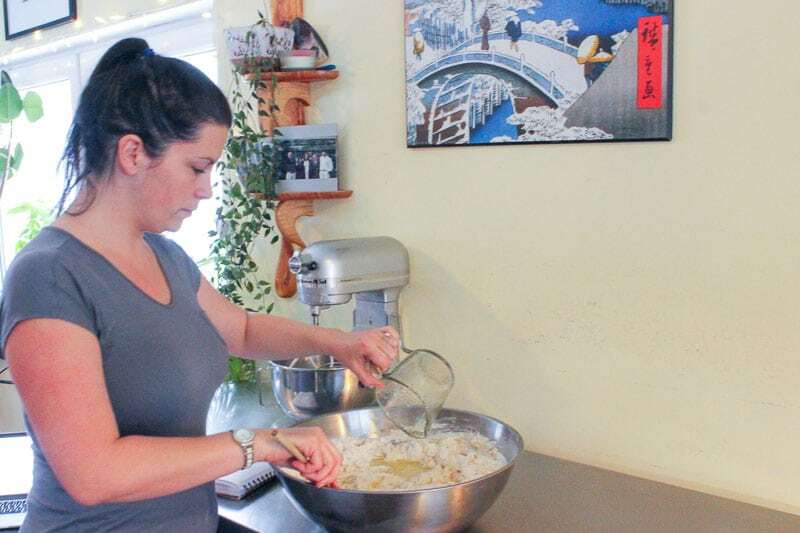 I like to wait to make the dough, because even though it will have to rise, there will still be time and I don’t want it to over-rise. Once your toppings are ready, preheat your oven to 450 degrees F and make sure your racks are centered in your oven. Mix up your dough. You can do this in four individual bowls if you want, but I hate washing dishes, so I used one big bowl and divided the dough in four to spread into the pans. We have two great dough recipes on our site and you could multiply either one of them by 4. Thin Crust Pizza Dough (No Rise!) and Simple Pizza Dough (thick crust). Oil your sheet pans with butter, oil or non-stick spray. Then spread out your dough on the pans. 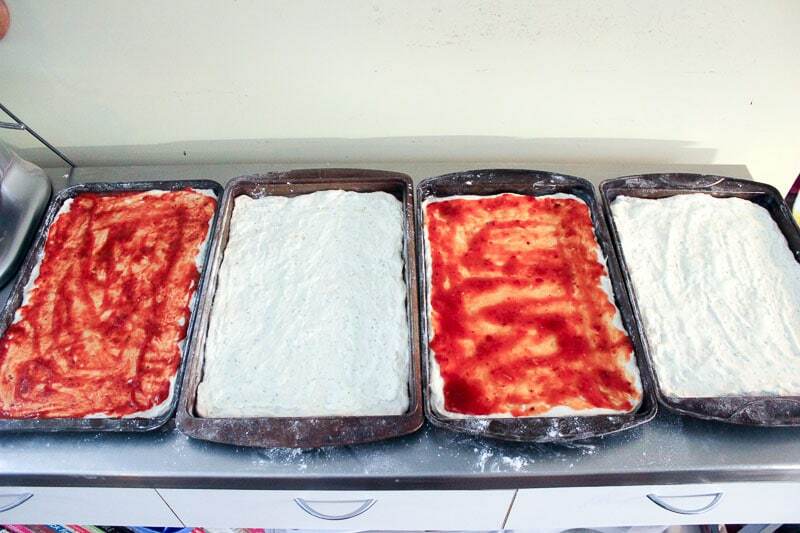 Spread sauces onto the pizzas. On the works pizza we used regular pizza sauce. For the cheeseburger and veggie pizzas we used the creamy garlic sauce from our Cheeseburger Pizza recipe and doubled it (OMG it’s so good) and for the Thai pizza we used a combination of barbecue sauce and sweet chili sauce (as in the recipe). Sprinkle cheese over sauce. Laurier is a firm believer in cheese under the toppings, and I’m not too picky either way, so that’s what we do. 🙂 On this day we used cheddar cheese for the cheeseburger pizza, but you can use either cheddar or mozzarella. I find around 2 cups of cheese (1/2 a large block) per sheet pan pizza works well. Add your toppings. You can’t see them in this picture, but we put little sticky notes on the wall above each pan so we’d know which toppings went on which pizza. Bake pizzas, two at a time, for 14-16 minutes, or until the crust is lightly browned underneath (just use a butter knife to pry it up and have a peek). Rotate the pizzas between the racks half way through the baking time so that each has some time on the bottom rack and on the top rack. 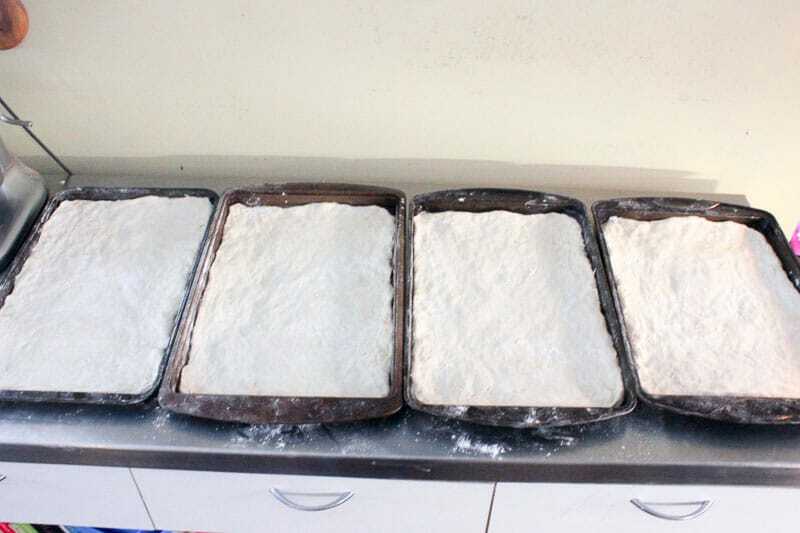 The baking time could vary slightly depending on how thick or thin your dough is. Use tongs to slide the cooked pizzas onto cooling racks (so they don’t get mushy) and let them cool completely. Then cut them into pieces and wrap them individually in either tin foil, parchment paper, stretch wrap, or whatever you like. Store in large freezer bags and label each bag so you know what’s in it. I’ll put some thawing and reheating suggestions below. How do I freeze an already cooked pizza? The most important thing when freezing an already cooked pizza is to let it cool completely before you wrap it up. Then cut it into pieces and wrap each piece well. Store a number of pieces in large freezer bags. These steps will avoid ice crystals forming on the pizza. How long can you freeze leftover pizza (or freshly made pizza)? Our pizza honestly doesn’t last long enough to worry about it. I will say, though, that I’ve found a stray piece of pizza in the freezer a year after the fact and it was perfectly fine to eat. So I’d say you could freeze it for up to a year. How can I freeze pizza dough? If you just want to freeze your pizza dough, instead of fully made and cooked pizzas, you can do that too. Make your pizza dough, form it into a ball and wrap it in stretch wrap. Then put your dough balls into large freezer bags. When you want to use the dough, take out a ball and thaw it on the counter for about an hour (maybe less, depending on the dough). Then use it as you normally would. You could also thaw it in the fridge for the day. How should I reheat freezer pizzas? You have a few options for reheating freezer pizzas, depending on whether you’re in a rush, and how picky you are. You can defrost slices in the microwave if you’re in a hurry and warm them in the microwave once they’re thawed. This will result in a softer crust. You can let the pizza thaw naturally at room temperature (probably within a couple of hours) or in the fridge (8 hours) and then heat it in the microwave or on a pan or tin foil in the oven (for a crispier crust). I always have homemade pizzas in the freezer as a go-to food for lunches. I have tried the cheeseburger pizza and the Thai pizza and have made my own variations. This is a must-try recipe for pizzas – easy and delicious!